Your device uses a Nano SIM card to provide you with access to your wireless service provider’s mobile data network. Only Nano SIM cards work with the device. Some LTE services may not be available depending on the service provider. For more information about service availability, contact your service provider. This device does not support 2G networks, so some functions related to 2G connection may not be available. Important: Use caution not to lose or let others use the Nano SIM card. Samsung is not responsible for any damages or inconveniences caused by lost or stolen cards. 1. 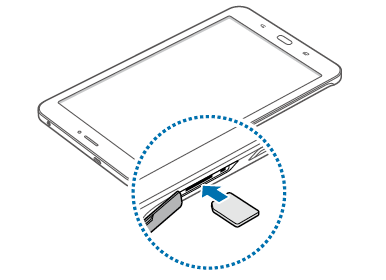 Open the cover of the SIM card slot (located on the top left side of your tablet when you look at its screen). 2. Insert the Nano SIM card with the gold-coloured contacts facing downwards. 3. 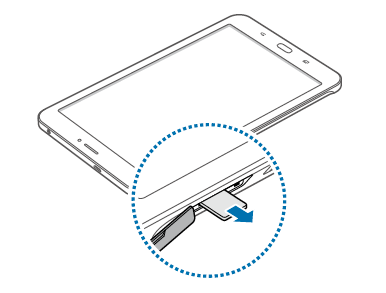 Push the Nano SIM card into the slot until it locks in place. 4. Close the cover of the SIM card slot. 1. Open the cover of the SIM card slot. 2. Press the Nano SIM card with your finger, and then pull it out.